Being involved in a collision is stressful, but getting your car fixed does not have to be. Bring it to Epps. We'll do it right. We have been your automotive body and paint repair specialists since 1988. Serving Bee Cave, Lakeway, Spicewood, Briarcliff, SW Austin, and Steiner Ranch. Our customers choose us because we do quality work at a fair price, and we get your car back to you ASAP. 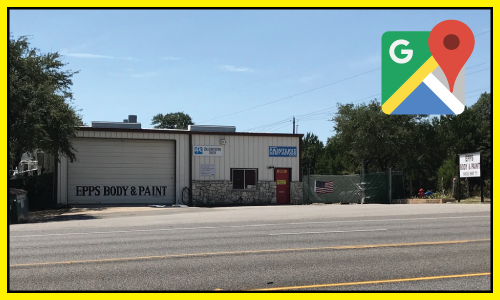 Since 1988, starting with Wayne Epps, this body shop has always been committed to delivering what we promise- superior craftsmanship by skilled technicians, management devoted to your service, and a dedication to doing the job right. We are able to take walk-in estimates on Tuesday, Wednesday and Thursdays. For estimates on Mondays and Fridays, please call for an appointment at 512-263-3221. It’s also really hard to write a good estimate in the rain, so if it’s raining please call first. Ask Us About ALUMINUM REPAIR!! A fair estimate should account for repairing the damage you can see…and the damage you can’t. At Epps Paint and Body Shop we are committed to the complete restoration of every vehicle. Details like correct frame alignment, balanced tires, and uniform seams around doors and windows may seem undetectable…but when a vehicle is properly repaired, its performance increases, while its risk of experiencing another accident drops. In 2010, Epps partnered with Five Star PDR to handle all our paintless dent repair (PDR) needs. Five Star will come to the shop and do any PDR while we complete other traditional repair jobs on your car. Often times people have a door ding they want pulled out while we are replacing a bumper. This can easily and affordably be done using the paintless technique. Of course, not everything can be done with PDR, but if it can, we recommend using Five Star. We trust Five Star to do a great job. They handled all our PDR hail repair after the 2015 hailstorm. We worked hand-in-hand for over a year on over 700 hail jobs. Our licensed auto body experts specialize in all aspects of collision & auto body repair and have exacting standards. We are committed to making your car good as new. No storm chasers here – we’ve been repairing hail and other weather related damage since 1988. Almost every hail repair job is a combination of PDR and traditional repair. I can't say enough good things about this company. I haven't had to have a car body repair in many years and so I was apprehensive about just choosing a company from the phonebook. Epps is near my home in Lakeway so I googled them and read testimonials that were very positive. I took my car there and found the staff to be very friendly and accommodating. They completed the repairs very quickly (on the day that they had projected for completion) and was very pleased with the results. The repair was impeccable and went above what was required. As I walked around the vehicle with the manager, checking the work, he spotted a few small 'dings' that were not related to the repair and proceeded to spot paint each one. He didn't have to do that, as none of those dings were included in the repair order but I appreciated his willingness to 'go the extra mile'. I highly recommend this shop to anyone needing body work. The shop is clean, the staff is knowledgeable, the atmosphere is professional. I will use them again and recommend them to anyone who needs work done.,,Thanx Epps... you earned my trust and respect and I hope this endorsement helps bring you more business. You deserve it. I have used Epps Paint and Body for years and have never been disappointed with the results. My recent repair looks like it never happened and that's what I like. My car is perfect and the service was the best. Everything and more that I was told was accomplished. Epps Paint & Body does an excellent job in repairing vehicles and providing great customer care. Unfortunately, I have had trouble backing out of my driveway, hitting unseen boulders and scraping guardrails. I have taken my vehicle to Epps four times. I have never been disappointed. Ian (the shop manager) and Tava (the woman that juggles 15 balls at one time and never drops one) are the best! I am extremely happy with Epps and I think Tava deserves a raise! Excellent customer service from start to finish and the car looks like brand new when you get it back. I cannot wait to go back for my wax/wash job in 30 days; first class service all the way! I am a lifelong customer for Epps! Epps did a great job repairing my Boxster after a deer ran into me. They were very professional and easy to deal with. I am very pleased with the work, the attention to detail, and I would highly recommend them. Ian (General Manager) did a fantastic job from start to finish. The final bill did not exceed the quote. I was out of town and couldn't pickup the car when it was ready but they did not have any problems storing it for me until I got back. Craftmanship was at or above factory quality. FANTASTIC experience! It is so refreshing to deal with intelligent and honest people like Ian (the manager) and his staff. Their work and customer service exceeded our expectations. While the drive and their hours are somewhat inconvenient, it's well worth the minor hassle to have them repair our car. An "overall rating" of "5" (highest option) is not fair, in my opinion, these guys deserve a much higher rating. Thanks, Ian, for a great job. Excellent work. Fair prices. Friendly environment. Ian helped arrange for a rental car to be ready when my wife dropped off the van for the repair. The work was completed a full day ahead of schedule. It's hard to find places like this now days. I recommend using them without reservation.,Thanks again Ian! Great staff, great work and I am completely satisfied. The folks at Epps were very professional and helpful in making repairs to my son's car. Their communication of what was needed, when parts would arrive, and how long it would take to complete was excellent. They did great work and answered all my questions. I would highly recommend them to others. I am a car fanatic who frequently enters his Camaro into car shows - I always go to Epps for my paint and body work necessities and am always satisfied with their show-car quality of work and professional transactions! ,Thanks Epps! You guys rock! We have used Epps on 2 different occasions. Each time they have done excellent work! The manager Ian is very professional and was a pleasure to work with. The last time they serviced our vehicle, the bill was $250.00 less than they originally quoted us. We would highly recommend Ian and the entire staff at Epps. Got questions? Need an appointment? Ready to drop off your car for repair?